As promised, we are working our way through numerous "Rapunzel" picture books in preparation of the upcoming Disney Tangled movie release. Disney's Rapunzel, with her amazingly long hair (70 feet long according to Disney), is the latest version based on the classic fairy tale. 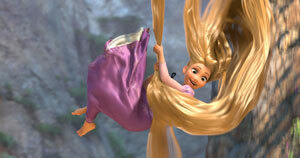 Like all fairy tales, the story of Rapunzel has been re-told and adapted many times. Although most of us are familiar with the Grimms' Rapunzel, earlier versions of the tale exist, notably Basile's "Petrosinella," and a French variant, "Persinette." (For detailed historical account, reference the online article, "Rapunzel, Rapunzel, Let Down Your Hair" by Terri Windling or read the author's note in Paul O. Zelinsky's Rapunzel.) In fact, in the early tales, the main character is named after parsley not rapunzel (a.k.a. rampion). The story of Rapunzel is far more than a tale about a girl living in a tower with long golden hair who is rescued by a prince. Windling writes that, "at its root this is a story about puberty, sexual desire, and the evils of locking young women away from life and self–determination." Some parents find the text age-inappropriate for young children, as evidenced by a few shocked reactions in online reviews of Rapunzel books. In many versions, while locked in the tower, Rapunzel is secretly wed to her prince and becomes pregnant. In some stories, the sorceress learns of the lovers' secret meetings when Rapunzel remarks on her expanding waistline. In other toned-down versions, readers later learn of her pregnancy when she gives birth to twins while exiled. Some retellings leave out the pregnancy altogether. The description of the villain also varies, but nearly always she is shown as a scary looking, extremely elderly woman (although not in the film Tangled). In some stories she is a sorceress or a witch and in others she's described as an evil fairy. I was surprised to find that in some stories, like in the Disney film, Rapunzel sometimes refers to her guardian as Mother Gothel, a German term for godmother. My daughter finds the beginning of the story upsetting because the sorceress takes the baby from her parents. When looking for picture books about Rapunzel, I recommend using Rapunzel book gallery on SurLaLune Fairy Tales as a starting point and searching your library's holdings. Hopefully my brief descriptions below will help parents determine which stories they may want to read to their children. We will continue to update this list as we read more stories. Beautiful retelling written and illustrated by the talented Zelinsky. Combines elements from both Grimms' tales and earlier versions and illustrated with gorgeous oil paintings inspired by Italian Renaissance art. History of Rapunzel described in author's note at the end of the book. The book won the Caldecott Medal in 1998. A lovely version of Grimms' classic story of Rapunzel with perfect storybook illustrations by Trina Schart Hyman. The wonderful, detailed borders and lush illustrations have a distinctive arts and crafts feel. Notes: Parents reside in a quaint cottage, they steal rampion from the garden of a witch named Mother Gothel. Rapunzel lives in old, derelict tower encircled by thorn bushes and upon meeting the prince, works to weave a ladder out of silk. Unfortunately, the witch learns of her secret when Rapunzel accidentally inquires why it takes longer for the witch to ascend than the prince. Marriage is mentioned briefly. Rapunzel gives birth to twins in a desolate place in the forest. This is my daughter's favorite version of the story but, sadly, it is out-of-print. This interesting version, based on a German tale older than the Grimms' tale, features Mother Gothel as an evil, ugly fairy. Otherwise the story plot is very like the typical Grimm version with Rapunzel betraying herself due to an absentminded question about the fairy's weight. Berenzy's story begins with an interesting description of the rapunzel plant, explaining that it can grow and bloom in the most desolate wastelands. Berenzy uses an unusual illustration technique, drawing with colored pencil and paint on black paper. The resulting illustrations are extremely detailed, show a wide range of light versus darkness and definitely exhibit a darker fairy tale world. Rapunzel lives in poverty for many years until the prince finally discovers her and their children who are no longer babies. Traditional retelling with beautifully detailed watercolor illustrations by the talented Dusíková. If you are looking for a version of the story without the twins, don't miss this one. It mentions both herb terms (rampion and rapunzel), the tower includes a hook to help pull up her visitors, the witch looks exactly as you'd expect and Rapunzel betrays herself by casually mentioning that the witch is heavier than the prince. As in the familiar tale, in shock, the prince jumps out the window, falls into thorn bushes and loses his sight. Dusíková includes plenty of animals in the illustrations...make sure to look for the brown owl. Only one complaint - both Rapunzel and the prince look very young, almost too young to get married. In this version, the sorceress lives in a castle and casts a spell on Rapunzel's mother, causing her to crave the rapunzel plant. Rapunzel's parents must give their baby to the sorceress in payment for stealing her plants. Like in most tales, the sorceress eventually moves the princess to a tower without stairs or a door. The prince visits Rapunzel in the tower and the next day Rapunzel, unable to tell a lie, informs the sorceress of the prince's visit. A spell cast by the sorceress causes the prince to go blind. Beckett's illustrations have a storybook feel and are a well-suited addition to this lighter version of the story. Simplified picture book version for beginning readers based on Grimms' tale. Wife eats rapunzel plants that her husband brings from the powerful witch's garden. Both Rapunzel and the witch wear colorful ornate clothing. In this retelling, the tower is located at the top of a large hill. Rapunzel works to weave a ladder of silk but the witch learns of Rapunzel's betrayal when Rapunzel accuses her of being slow and clumsy at climbing, unlike the prince. Downing's colorful watercolors add beauty and light to the story. A hilarious rhyming tale of miscommunication between Rapunzel and the prince. He yells for her to let down her hair, but she is unable to hear him clearly and throws down everything but her hair (including socks, cantaloupe and a swine). The story has a silly, surprise ending. Monks' wacky and vibrant mixed-media art is done using acrylic paint, paper montage, and colored pencils. Hallmark released a series of animated classic fairy tales on video in the early 1990s called "Timeless Tales from Hallmark." They also published the stories in book form, including a version of Rapunzel. Hallmark's Rapunzel will most likely appeal to Disney Princess fans. The illustrations are cartoon-like and colorful. However, the story strays from the traditional. The witch, Scarlotta (who likes like an older version of Disney's Mother Gothel), turns the prince into a bird on his return visit to the tower. Later on, Rapunzel's tears reverse the spell. Unlike many other versions, this story does mention that Rapunzel is reunited with her parents. Disney Books for Young Readers, a division of Random House has published several movie tie-in books to correspond with the new Tangled release. A complete list of the books can be found at: http://www.randomhouse.com/kids/disney/books/TAN/Tangled/ along with downloadable printable pdf activities. Rapunzel's Revenge is a graphic novel of Rapunzel set in the Wild West. It's awesome!!! You'll love it if you haven't read it yet. I enjoyed this timely post. Rapunzel was one of my favorite childhood fairy tales. Do you like this adaptation to iPad? Rapunzel's revenge=awesome! Love Shannon Hale! My favorite version though is the one by Barbara Rogasky and is the one I own! Wonderful post! Wow--this is an awesome list--just what I needed. I had a feeling it wasn't a very 4-year-old friendly story--but for the life of me, I couldn't remember why. :) It's been a while since I read through my grimms anthology. I'm going to look for these to satisfy my own curiosity--thanks for leaving the link and for telling me your favorite illustrator. I really hope to find that one. I'm going to add this link to my post--it's so great!